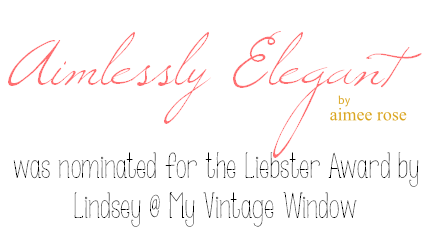 Yesterday I received an awesome message from Lindsey @ My Vintage Window, she nominated me for a Liebster Award. If you don't know what a Liebster Award is, don't worry. . .I didn't either, until yesterday that is! The Liebster Award is a way for bloggers to promote other small, up and coming blogs to their readers. I did a little Googling (because that's what you do to find all answers now, right?) and came up with the Liebster Award rules. 1. I have danced nearly all my life, since I was 5 years old, and I still love it! 2. I love being at home, more than anywhere else. 3. I have the biggest sweet tooth, I have learned to control it mostly, but it still gets away from me. 4. I consider shopping my therapy, you can tell when I've had a stressful week! 5. I can not keep my house clean to save my life, I feel like the minute I turn around it gets dirty again. 6. I am a creature of habit and routine, it gets me though my day to day! 7. I grew up outside of Madison, WI. 8. I love being on the water, lake, ocean, river, doesn't matter. 9. I was a competitive swimmer from the ages of 5 to 19. 10. I consider myself a highly self motivated person, sometimes I think it drives my husband crazy. 11. I don't like traveling as much as I think I should (see number 2). 1. Do you have any pets? If so, what is your favorite things about them? I have 2 cats, Charlie and Max. I love their different personalities. Charlie is a gentle sweetheart who will lay on his back and cuddle, Max is more bossy and headstrong. 2. What is your favorite blogging topic? Anything to do with house projects. I love seeing the before and after pics, even when it feels like I haven't done that much it reminds me of how far I've come. 3. How did you meet your significant other, if you don't have one... What would be your dream date? I met Martin online! I had recently gone through a bad break up and was working crazy hours, I thought whats the worst that can happen. I wasn't convinced I wanted to go full force so I signed up for a free dating site, and within a month I had met Martin. 4. What is the one TV show you can't miss every week? Right now it's Nashville, loving that show. Next week it will be Mad Men, can't wait for it to start again! 5. If you were to take a trip to Disney, what is one thing you couldn't miss? "It's a Small World" ride. It is the one thing I remember about Disney from the very first time I went when I was about 3 or 4 years old. We went again when I was a teenager and visited that ride. 6. Cats or dogs... why? Cats. I've always grown up with both, and love both. I hope to have a god someday, the only reason I don't right now is because of my crazy schedule. Cats trump for me right now just because they are more self sufficient! 7. What is your least favorite household chore? Dusting! It always feels like its never ending, how do we produce that much dust! And I think its so gross. 8. Rollercoasters... yes or no way? No way. I used to like them. Then on a trip to Great America a few years ago I hated every single one, no longer fun! 9. What is your interior decorating style? I think I would say transitional. I'm not classic, and I'm definitely not modern. I like a mix of the old with the new. I like to keep my spaces feeling casual so you feel like you can live in them. 10. What is your favorite physical feature and why? I'm going to go with my eyes. I like that they change colors with what I'm wearing, they can look anywhere from green, to blue to almost gray. 11. What blog can you not go without reading? Young House Love, it was the first blog I started reading years ago. I love their style and projects. 2. When you were 5 what did you want to be when you grew up? Did you do it? 3. What book should I be reading? 5. What is your best skill? 6. What do you wish you were better at? 7. What was your motivation behind starting your blog? 8. What is your favorite way to exercise? 9. Which do you prefer, eating out or cooking in? Why? 10. What is your favorite weekend activity? 11. What is the next big decision you have to make? Here are the bloggers I am nominating for the Liebster Award. If you have been nominated before, sorry, just trying to spread the love! I hope you check out these other blogs! Thanks so much for stopping by today, and thanks again to Lindsey for nominating me, this was fun! Congrats on your award and thank you so much for the nomination! What a perfect post to stop by your blog for!! I'm totally a creature of habit and get so thrown off if my day is different! So awesome getting to know you. That's awesome that you danced for so long a a I am totally a creature of habit too, so I totally get you on that. Thanks so much for stopping by and following! Glad I could pass it along, can't wait to read more about you! Have a great day! It's been fun to get to pass it along and recognize others! Looking forward to getting to see your answers! Love this!!! Love getting to know you. Your blog is beautiful. Love the name! I'm with you on style: I feel a bit transitional as well. I hate DUSTING! Look forward to reading more posts! New follower! Thanks for the nomination, lady! I plan to dedicate a whole post to this next week over on my blog. :) I hope you check it out - I loved getting to know more about you and your blog through this post. 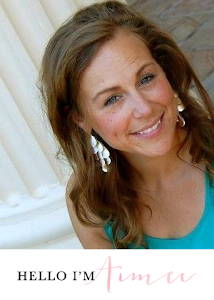 Karly, I can't wait to check out your post! It's great getting to know the faces behind the blogs a little bit more!